As promised in the previous blog, the next few blogs will expand on the charts from my presentation at SciTech 2016 on 5 January in San Diego. Although this chart appears towards the end of the presentation, this is a good chart to start with since it seemed to invoke the most response, and the most positive response, from the audience. People are motivated by meaningful work. And it is important that the leadership continuously reminds them that their work and their contribution to that work is important. Laying down a culture of supporting the warfighter may start with managers and leaders, but will spread to the point that team members will remind each other of the importance of their work. Personal frictions will happen. Tempers will flare. But when these conflicts happen in support of the mission people always find a way to pull together in the end. Here is an area I did not have the time to delve into, a corollary statement: people want to feel competent in their work. How can you feel you are making an important contribution to an important goal, if you do not feel you know what you are doing? In fact, large numbers of people in weapon system sustainment do not feel competent, they feel very uncomfortable. I am referring to those who have just gotten a new position and are still learning their jobs. In addition, others who are very, very competent, from great training and years of experience, can still have days were they feel completely overwhelmed. They can wonder if they have been “faking it” all this time. So, really, anyone can be teetering on the edge of a bad day. If that is the day you choose to point out all of their faults, the result will not be a better team member, the result will be one less engaged person on your team. 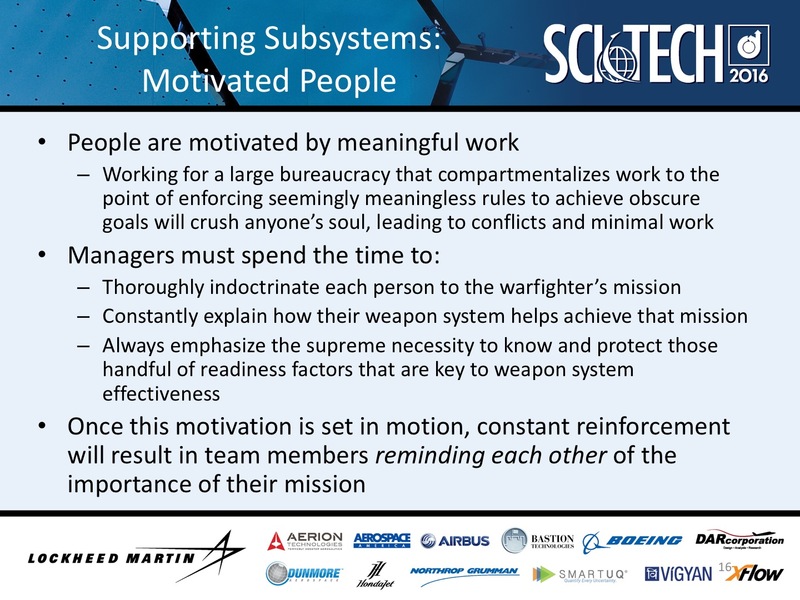 Personal critique, however, is necessary in order to meet the organization’s goal of sustaining the weapon system. The trick is to provide it in a positive and helping manner. Formal classroom training and personal one-on-one coaching are great ways to help your folks feel more competent and engaged. If you are a supervisor or boss, take the time to coach folks in areas that you are more competent in. DON’T JUDGE them personally just because you know the area very well. And don’t just offer your assistance. Provide your expertise in the form of one-on-one training, and then follow up to see if they have learned what you have taught. If you are not a supervisor or manager and you provide your team members with one-on-one time then you are a leader and will soon be a manager if you wish to be.